Most of us are involved in Small Group Bible Studies or Discipleship groups or Spiritual Mentoring relationships. Many of us are leading those groups so we have extra responsibilities and accountabilities for the other people who are involved. God has made it very clear in his word to us that it’s our responsibility is to point people to Jesus. It’s not about us, it’s not about how much we like the people in our group, it’s not about who is the best leader of the group. It’s all about Jesus. John the Baptist knew this. In John 1 we read that he and 2 of his disciples saw Jesus passing by and John the Baptist said, “Look, the Lamb of God!” And then John’s disciples decided to go and follow Jesus. One of these men was Andrew who would become one of Jesus’ inner group of Twelve disciples. 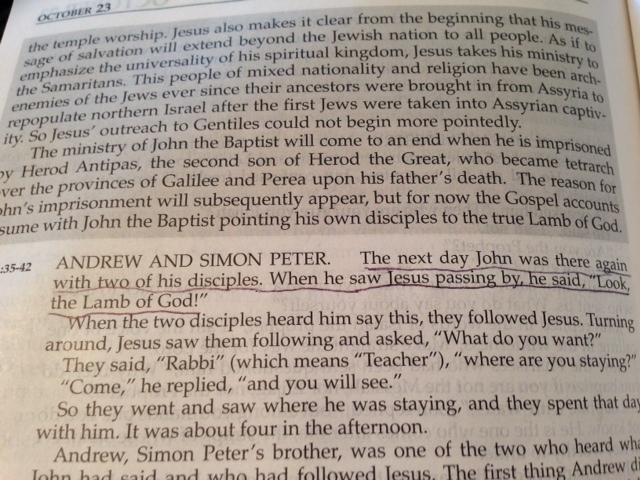 Andrew went to find his brother, Simon Peter, who would become the Rock upon whom Jesus would build his church. The BIG church – for the whole world. We can see God’s plan beginning to take shape – because John the Baptist pointed others to Jesus, not to himself. Later, we will hear that John the Baptist says that Jesus must become more and John himself much become less. Isn’t that what we’re all called to do? We love you, dear Jesus! Truth, Judy. It is all about Jesus!